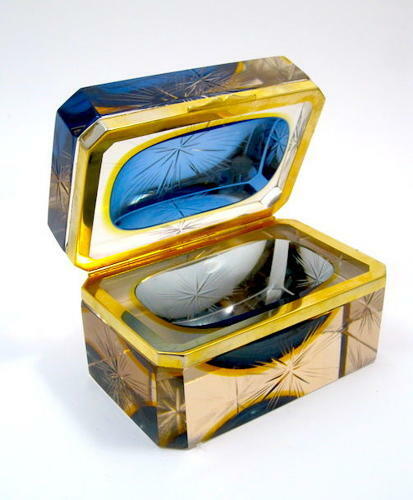 Vintage Murano Sommerso Blue Glass Casket and Dore Bronze Mounts with Original Label. Antonio Da Ross, a Highly Skilled Venetian Glassmaker, First Developed the Sommerso Technique in Murano in the late 1930’s. His Work Suddenly Became Famous Thanks to the Effect of Contrasting Sunken Colours Inside One Single Piece and were Soon Recognized by the Venice Biennale and Many Other Museums Across the World. Paolo Venini, Another Famous Glassmaker, Perfected the Technique around the Same Time, but it was Seguso d’Arte who Made it World Famous During the 1950’s. One of the Most Common Techniques is Sommerso, which in Italian Literally Means “Submerged”. This Technique is Used to Create Several Layers of Glass (Usually with Different Contrasting Colours) Inside a Single Object, Giving the Illusion of “Immersed” Colours that Lay on Top of Each Other without Mixing. This is Done by Uniting Different Layers of Glass through Heat and Repeatedly Immersing them in Pots of Molten Coloured Glass. This Technique is Quite Recognizable: it is Characterized by an Outer Layer of Colourless Glass and Thick Layers of Coloured Glass Inside it, as if a Big Drop of Colour had been Captured inside the Transparent Glass.